Whether your facility has been around for years or is currently under construction, protect your fibrous insulation and fireproofing with Protek-13. Protek-13 is a spray-applied, water based vinyl acrylic emulsion containing interlacing/bridging fibers forming a protective white coating over fibrous surfaces. Protek-13 provides a protective coating for your fibrous surfaces without significantly affecting the acoustical performance of the material underneath. The following test was conducted by spraying two separate thicknesses of Protek-13 over 1.75″ of K-13 Spray-On thermal/acoustical insulation. System 1 was applied in a standard coating, covering 96-98% of the K-13 underneath. 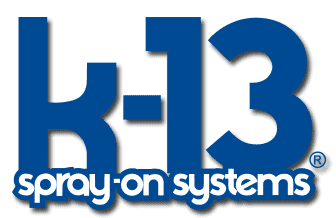 System 2 was a heavy build, covering 99-100% of the underlying K-13. The following chart shows the acoustical performance of both systems. High traffic areas are often vulnerable to physical damage from personnel, machinery, birds and other sources. The tough resilient surface of Protek-13 resists abrasion and prevents the “picking away” of the fibers. This protection can greatly extend the useful life of the covered building materials. Dust, dirt, grease and fumes are present in almost every industrial environment. The firmer, more uniform surface of Protek-13 significantly reduces the accumulation of these airborne contaminants. In addition, Protek-13 can easily be swept with a broom, blown clean with compressed air or lightly washed with water (no scrubbing). Protek-13 is Class 1, Class A tested according to ASTM E-84. The application of Protek-13 can brighten your whole facility. This high light reflectivity greatly improves the safety of the working environment without requiring an increase in lighting power. Fibrous or porous substrate materials will absorb a great deal of regular paint without showing a significant color change. Protek-13 due to its bridging and interlacing fibers provides an easily obtainable uniform color (at the surface) requiring less material. If a custom color is desired at the time of installation, Protek-13 can be custom blended to match your design color scheme.